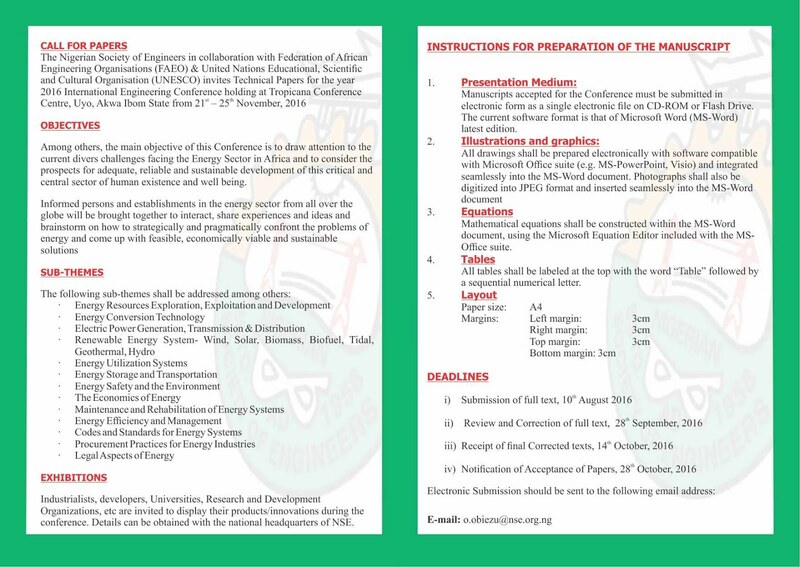 The Nigerian Society of Engineers in collaboration with Federation of African Engineering Organisations (FAEO) and United Nations Educational, Scientific, and Cultural Organisation (UNESCO) invites Technical Papers for the year 2016 International Engineering Conference holding at Tropicana Conference Centre, Uyo, Akwa Ibom state from 21st – 25th November, 2016. Manuscripts accepted for the conference must be submitted in electronic form as a single electronic file CD-ROM or flash Drive. The current software format is that of Microsoft Word (MS-Word) latest edition. Mathematical equations shall be constructed within MS-Word document, using the Microsoft Equation Editor included with the MS-Office suite. All tables shall be labeled at the top with the word “Table” followed by a sequential numerical letter.